As the ‘Veteran voice of the Octagon’ always says – ‘It’s timeeee!’ However rather than fighting for three or five rounds inside the cage it’s time for us to win lots of money with the UFC slot machine! With the world famous Octagon on view in the background this licensed slot machine has been developed by Endemol and they have done a sensational job creating an adrenaline pumping slot which brings the gruelling fight atmosphere of the Ultimate Fighting Championship to the reels. It includes official fighters, ring girls, sounds and more - along with two very rewarding bonus features. It is a slot machine with 5 reels and 20 paylines, and it offers generous slots betting options with the bet per line ranging from £0.01 up to £25 enabling a minimum spin of £0.20 and maximum of £500 when all paylines are played. We all have a favourite fighter and once you load the UFC slot machine you are requested to choose one of twelve to acts as your Golden Wild throughout gameplay – though you can easily change to a different fighter at any time using the ‘change fighter’ option. It’s important to remember that this slot was released a few years ago so your favourite fighter may not be featured but there are several legends to choose from. These include: ‘The California Kid’ Urijah Faber, ‘Suga’ Rashad Evans, Chuck ‘The Iceman’ Liddell, Rampage Jackson, Jon ‘Bones’ Jones, Georges ‘Rush’ St-Pierre, Frankie ‘The Answer’ Edgar, Michael ‘The Count’ Bisping, Cain Velasquez, Brock Lesnar, ‘The Prodigy’ BJ Penn, and Anderson ‘The Spider’ Siva. Once you make your decision a photograph of your chosen fighter appears on the left of the screen and you are prompted to press the ‘Go’ button which sees fight announcer Bruce Buffer shout out his world famous catchphrase ‘It’s timeeee!’. Fans of the UFC will be chuffed to see familiar symbols and sounds from the company featuring. As already mentioned, the games Wild is chosen by you as your favourite fighter and while it doesn’t substitute for the bonus symbols, if you manage to land it in any position on reel three your fighter expands to fill the whole reel. 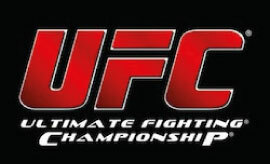 There are two bonus symbols to look out for – the UFC Belt and Fight Gloves which are required for bonus features, and these are joined by announcer Bruce Buffer, Octagon girls Brittney Palmer and Arianny Celeste, the official UFC logo, the Octagon, punch bag, and Ace to J playing cards. As it is a licensed slot the official UFC soundtrack plays out which brings energy to the reels, along with the sound of the crowd cheering. This really adds authenticity to the UFC slot to make it more enjoyable as compared to Novomatic slot machines which use the same sounds over and over again in their slots. Before the battle begins every fighter has to go through a gruelling training regime, and putting in a good performance in training with the UFC slot machine sees you rewarded with big wins. First you will need to land the Training Bonus symbols (UFC gloves) on reel 2, 3 and 4 during the same spin. You will then be presented with a new screen where your chosen fighter is displayed along with some statistics (strength, stamina and experience) and six cards which hide opponents. You simply pick one of these six cards and are then matched up against the opponent with your fighter’s statistics compared to his and then rewarded with free spins if you manage to outperform him during training. The aim is to get a star for having the best strength, stamina, or experience in each matchup – with three rewarding you with bonus spins. Even more rewarding is that landing three Training scatter symbols anywhere as your free spins play out sees you rewarded with an additional 15 free spins added onto your counter! With training over its time to put the practice into action as you take to the Octagon after landing the UFC Belt symbol on reel one, three and five during the same spin. This feature plays out like a video game as you are pitted against an opponent with both fighters having an energy meter. A reel with various different actions scrolls along the bottom with a button for you to select your move at random. Good moves increase the chances of your fighter defeating his opponent and it actually plays out on screen with credits rewarded based on the outcome of the fight – with a win being worth substantially more. Endemol – take a bow for victory as this is one incredible slot machine! Slots developers often struggle creating licensed slot machines online, but with official figures and sounds from the Ultimate Fighting Championship featuring on the backdrop of the famous Octagon, fans of mixed martial arts will absolutely love spinning the reels on the UFC slot machine. It contains two very rewarding bonus features that promise big wins, with my favourite being the Fight Night Bonus which plays out like a video game!